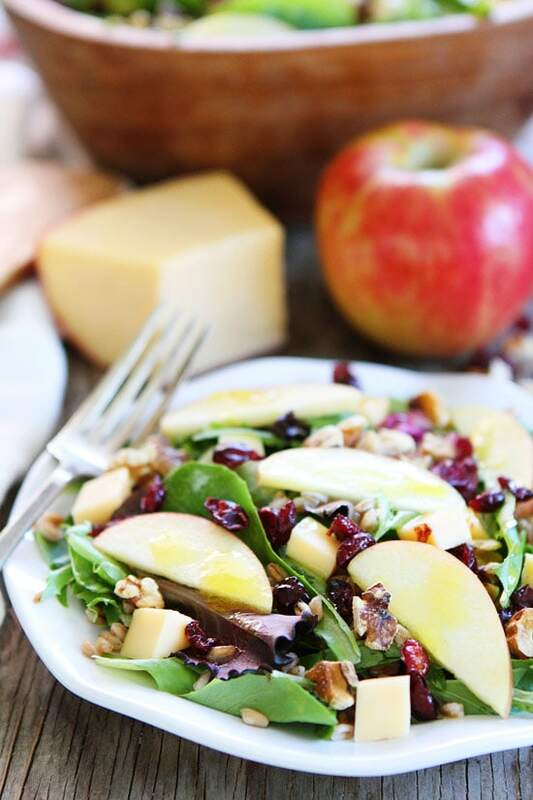 Apple, Gouda, and Farro Salad-mixed greens with apple, Gouda, farro, toasted walnuts, dried cranberries, and simple apple cider vinaigrette. This delicious salad is perfect served as a side dish or main dish! I kind of od’d on pumpkin cookies last week. I can never stop at five or six cookies. Oops! So this week is all about salad, you know, to balance out my big cookie binge. 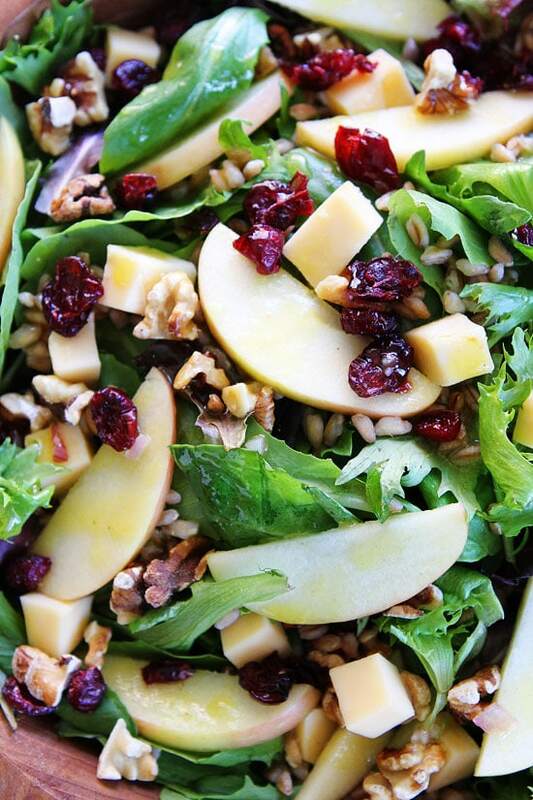 My current favorite salad is this Apple, Gouda, and Farro Salad. It is healthy, hearty, and super delicious. I could eat it every single day for the rest of my life. It is that good! And guess what? Thanksgiving is NEXT week! I bet you are all looking for the perfect salad to serve at your Thanksgiving feast, well, look no further, this is the ultimate fall salad and the perfect addition to your Thanksgiving meal. I don’t do wimpy salads. I want a salad that is full of flavor and textures. 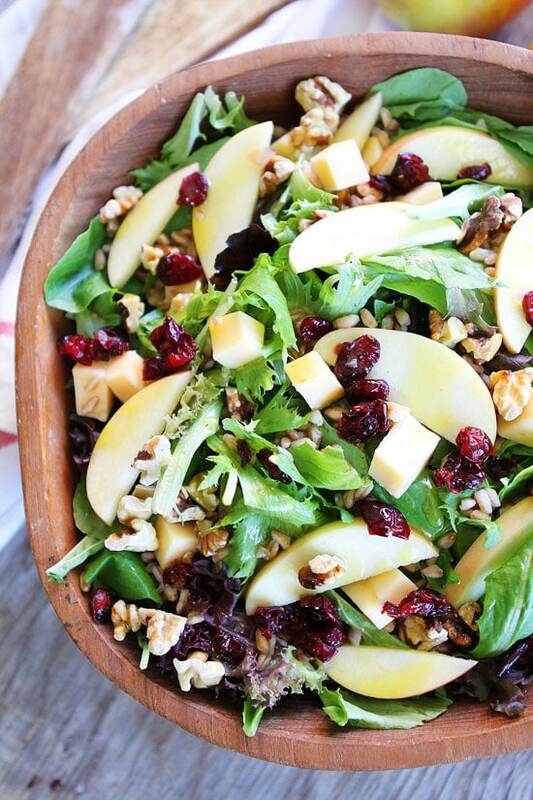 This Apple, Gouda, and Farro Salad fits the bill. It has lots of goodness going on. 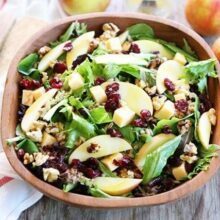 I top mixed greens with apple slices, Gouda, farro, toasted walnuts, dried cranberries, and a simple apple cider vinaigrette. Yep, this salad has it all! I love using Arla Donfio’s Gouda cheese because it is made with few ingredients and without artificial flavors or preservatives. 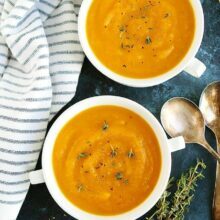 It is rich, creamy, and has a slightly sweet flavor, which pairs nicely with the apples. I like to use Honeycrisp apples because they are so good right now, but feel free to use your favorite apple. Any variety will work! This salad can be served as a side dish to any meal or can be enjoyed as a main dish because it is so satisfying. I am going to eat it for lunch this week. Is it lunch time yet? I can’t wait! I love all of the fall flavors! I know my family and friends will love this salad too, so I am making it for Thanksgiving. 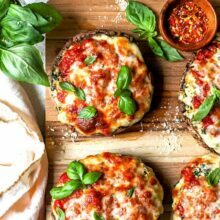 It is sure to be a hit…and a nice balance with all of the other indulgent foods that will be at the table. This hearty and healthy salad is always a favorite. Serve as a side dish or enjoy as a meal. First, toast the walnuts. In a small skillet, toast the walnuts, over medium heat, stirring frequently. Cook until the walnuts turn brown and smell toasted. This will take about 5 minutes. Transfer to a small bowl to cool. Place the greens in a large bowl. 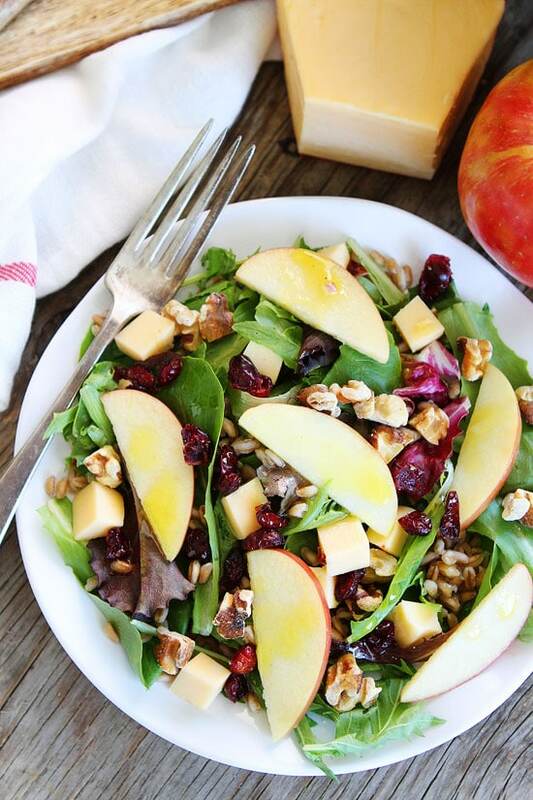 Top with sliced apples, Gouda cheese cubes, farro, dried cranberries, and toasted walnuts. To make the vinaigrette, whisk together the olive oil, apple cider vinegar, honey, mustard, and shallot. Season with salt and black pepper, to taste. Drizzle the salad with the vinaigrette and gently toss. Serve! Note-I like to use Honeycrisp or Granny Smith apples, but any apple variety will work. I also like to use Trader Joe's 10 minute farro. Disclosure-this post is in partnership with Arla Dofino, but our opinions are our own. 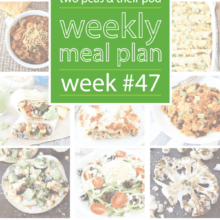 Thank you for supporting the brands that continue to make Two Peas and Their Pod possible. This sounds wonderful and perfect for Thanksgiving. My favorite salad I make is a farro and arugula salad with lemon vinaigrette but this with the apple cider vinaigrette and Gouda sounds sensational. I think I’ll test it out this evening. The Gouda really makes this salad!! I hope you like it! Thanks!! I am obsessed with this salad! Oh this salad is calling my name! I am going to have to add this to my menu! I hope you like it! It’s my new favorite! 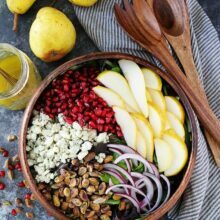 This is such a gorgeous Fall salad!! I love all the ingredients! Beautiful salad. I have yet to try their cheese, so I defintely need to get on it and find some. Pomegranate arils will be a great addition! I used Kroger’s apple cider vinegar. 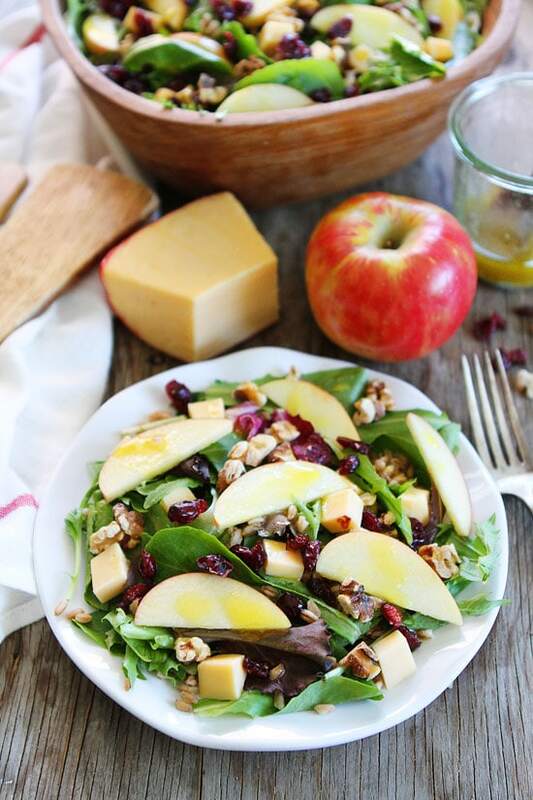 Love gouda cheese….such a great salad! Gouda is one of my favorite cheeses (especially smoked! ), and it is wonderful with fruity flavors. This combo looks perfect! I love all the color and awesome textures. Farro is also one of my favorite grains–wonderful served cold in salads or cooked like risotto! This might just make it on our Thanksgiving table!! 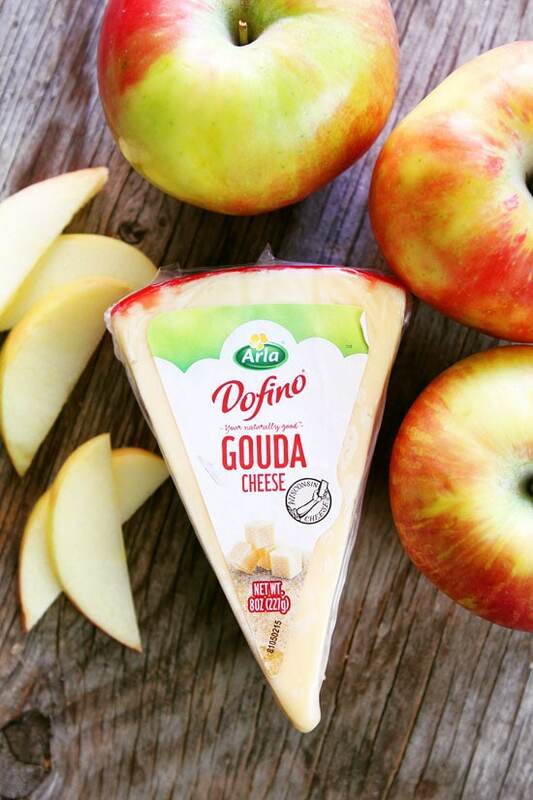 Apples and Gouda (especially a smoked Gouda) is one of our favorite snack combinations. This salad looks wonderful! As much as I want to eat this today, I might have to wait to make this amazing-looking salad. I could probably substitute brown rice or whole-wheat couscous for the farro, but, sadly, I don’t have any Gouda on hand; I don’t know if any other cheese would be a good replacement. Made this yesterday and it was amazing! Now I am making another batch for my work lunches this week. Yay! So happy you loved the salad! I’m so excited to try this. I’ve been looking for a farro salad using apples and nuts. The dressing sounds fabulous,too. Thanks for sharing. I just made this- and it is perfection! Thank you for another great recipe! I followed the recipe exactly except that I used grey poupon instead of dijon mustard. Never used Farro. Can I cook it ahead of time and then add to salad a few hours later? Or put it all together and keep in refrigerator for a few hours.